Hi, again, everyone! 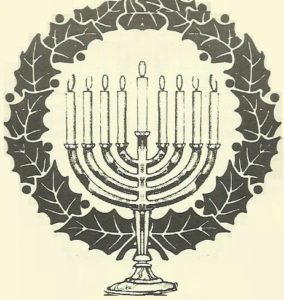 First of all, happy Chanukah/Hanukkah to all of those celebrating this wonderful 8-day, traditional Jewish “festival of lights”! Whether you say “Shalom” or “Noel” – both words mean “Peace”. It is the season of love, hope and understanding! We are all different, yet so alike, and that’s okay. Cheerish it! Embrace it! Own it! Celebrate it! “Let there be peace on Earth…” and let it begin with each and every one of us! 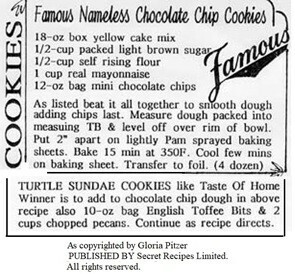 “Every year at this time, we put our very best wishes together with some warm & worthy thoughts, and send them off to you, wrapped in sincere affection and the dearest hopes that this coming year gives you all you expect and derive from it.” – Gloria Pitzer, Gloria Pitzer’s Secret Recipes [TM] Quarterly, Winter 94/95. As I make out this year’s Christmas cards from my husband and I to all of our friends and family, I can’t help but reminisce over the past year. 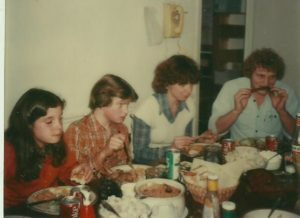 Last Christmas was a rough one, as Mom’s health seemed to deteriorate in December. 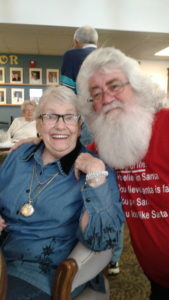 I didn’t do the yearly card tradition for my husband and I; as, instead, I helped Mom to write and send out her own Christmas cards – not knowing it was for the last time. 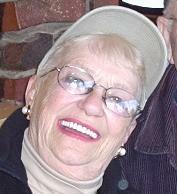 It was such a rollercoaster ride that month and the next, as she seemed to get better and worse and better again (which, I understand, is usually what happens at “the end”) until she passed away peacefully on January 21st, of this year, lovingly surrounded by family and care-givers and friends. One “hidden blessing” in Dementia is the ability to recall old memories with clarity, like they happened recently. 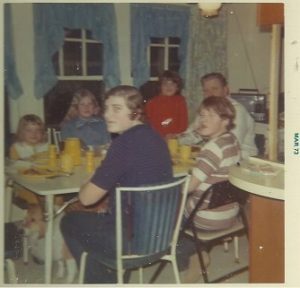 Mom often reminisced with me and my kids and grandson on our visits with her, about stories of some of our relatives, whom were long gone, from her chilhood memories. She couldn’t understand how she could remember such things, like they happened yesterday, but couldn’t remember who she actually saw or spoke to that previous day. It was also very hard for her to look in the mirror, as she didn’t really recognize the face staring back at her because her mind was often in the past, including how she looked then and not currently. As discussed in Scrapbook Photo Albums are Therapeutic for Alzheimer’s Patients by Mark B. Mizen, Ph.D., Director of Technology at Creative Memories; Saint Cloud, MN, photographs and scrapbooks and journals are such important “tools” for those who suffer from Dimentia and Alzheimer, as well as for their families, friends and care-takers. If only hindsight was forsight! 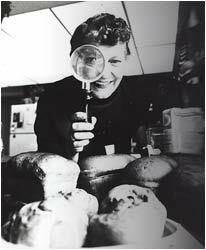 I wish now, that I had written more of her stories down or, better yet, recorded the conversations. We always tend to think there’s time for that later…but then, in the blink of an eye, that time is gone. 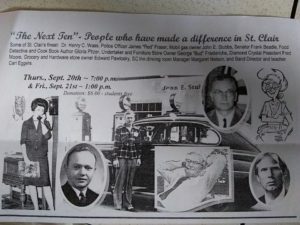 Over 26 years ago, Mom wrote in one of her newsletters about her and my dad’s plans for a Christmas present to me and my siblings, of a cassette recording of the two of them talking about their life together and their most dearly remembered and cherished moments; plus, memories of their grandparents, whom we (my siblings and I) never got the chance to know; as well as other stories about the family that we could pass on to future generations. I so wish they had followed through with that gift. It would’ve been priceless to me and my own children, as well as to my grandson. I’ve always loved Mom’s artistic way with words. 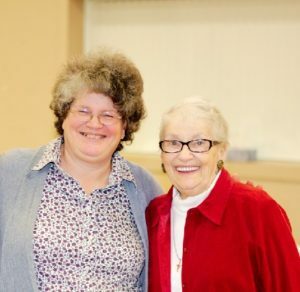 Her love for writing and journaling helped her, somewhat, to deal with the Dimentia from which she suffered after a double stroke and “grand mal seizure” in 2015. The writing was as much a form of therapy for her as it was just a natural reflex. Mom penned her feelings and memories in journals for most of her life. My younger sister has all the journals that still exist. Some were lost or destroyed over the years. 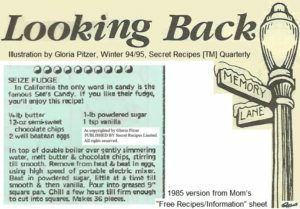 But, Mom also recorded some of her feelings and memories in every one of her publications too. 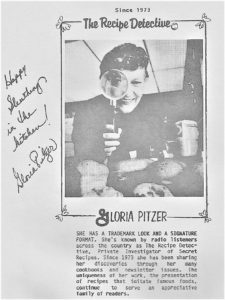 I really do enjoy re-reading all of her “Food for Thought” memories that are in her old books and newsletters of which I still have copies. A lot of what she wrote about was regarding finding the blessings in any given moment – good and bad, alike – for that was how she was raised. 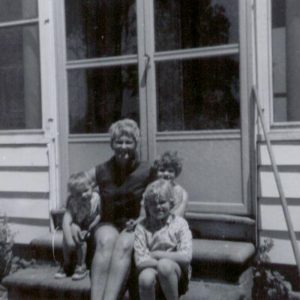 Being grateful everyday for what she confronted and overcame was a big part of Mom’s journaling. 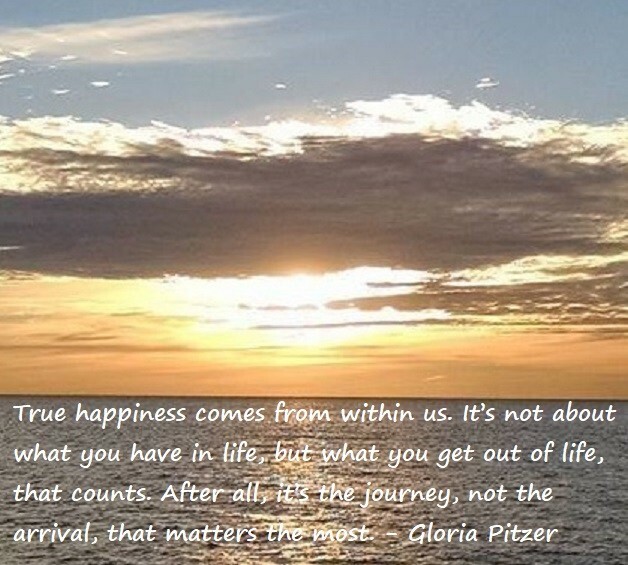 “The celebration of the moments worth remembering continues to have its place. 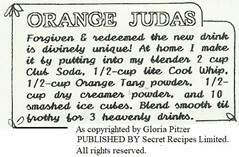 ” – Gloria Pitzer, Gloria Pitzer’s Secret Recipes [TM] Quarterly, Wnter 94/95. 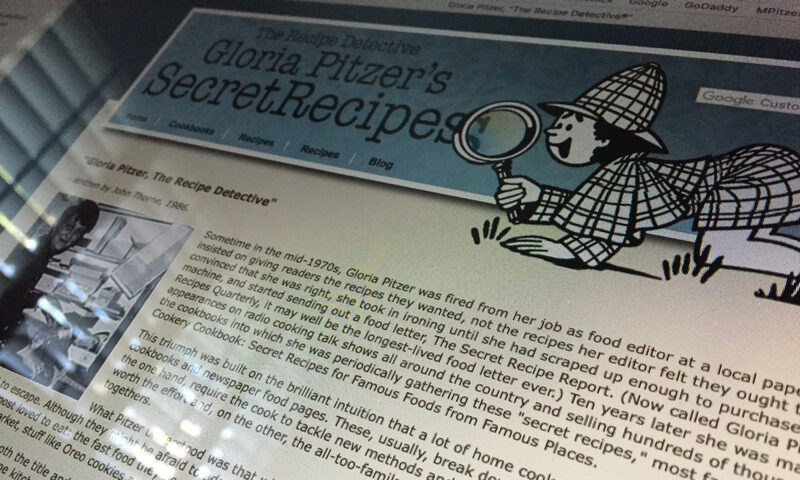 This recipe, unlike most of the others I’ve shared here, does not appear in her last book, “Gloria Pitzer’s Cookbook – The Best of the Recipe Detective” [published by Balboa Press (January 2018, 1st Printing) – a re-write by me, Laura Emerich, of Mom’s famous, self-published book, “Gloria Pitzer’s Better Cookery Cookbook” (May 1983, 3rd Printing)], an 8.25×11-inch, “Perfect Bound Softcover”, 322-page cookbook (also available as an eBook) published in January 2018 and available for purchase (ISBN: 9781504391214.) 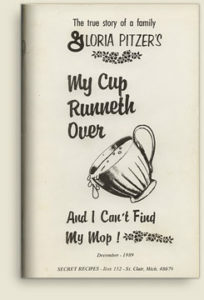 However, you will find, in this book, Mom’s make-alike recipes for Niagara Falls Fudge as offered at the Maple Leaf Village in Niagara Falls, Ontario (Canada); as well as her “Somewhere In Time Chocolate Fudge”, like “Murdick’s Fudge”, Mackinaw Island, MI referenced in a scene in the movie, after which she named her version. This memory is not exactly of my mom…not directly anyway. 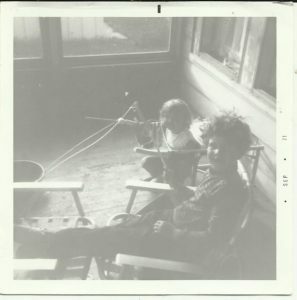 Some of my favorite early childhood memories are of fishing with my dad and two brothers. 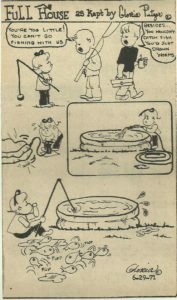 My brothers didn’t very much care for me tagging along, but Dad was happy with my enthusiastic interest in fishing… especially, I think, because I liked to find the worms with which for him to bait our hooks. I was pretty good at it too! 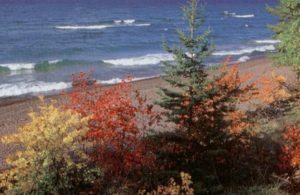 We were living in the Algonac-Pearl Beach area (of Michigan), on the beautiful St. Clair River (part of the St. Lawrence Seaway), across from the North Channel (west of Harsens Island) that flows into Lake St. Clair. We fished off the end of our dock often, Spring through Fall; for bass, perch, walleye, whitefish, trout, salmon, etc. – whatever was in season at the time. One day, when I was about 7 or 8 years old, fishing with my dad and brother, Mike; my line caught something that I just couldn’t pull in by myself. Dad came over to help me. I was very excited that I had caught something, and it was apparently BIG because I couldn’t reel it in by myself! After a couple minutes of struggling, even with Dad’s help, we finally got it pulled up to the surface of the water, only to find it was an old shoe filled with mud! Dad helped me to cast my line out again and I patiently waited for a real bite. Then, I got a rather strong pull on my line and Dad had to help me reel it in again – this time it was an old coffee can filled with mud! My brother, Mike, got the biggest kick out of that and roared with laughter!!! Dad set me back up with a new worm on my hook, to try again on the other side of the dock, hoping I wouldn’t catch another shoe or can of mud. Within MINUTES I had hooked something big and heavy again! Mike teased me that it was another can of mud. But, as Dad helped me, again, to get the object to the surface, we saw it was a HUGE catfish, which broke my line as soon as we got it up on the edge of the dock. It flopped back into the water and swam away quickly. 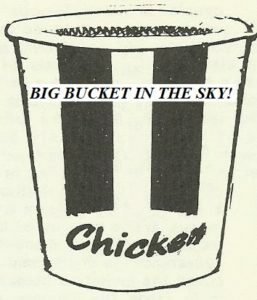 So, I do have a story about “the one that got away” – and it was real! I love the aroma of a good fish fry!!! Mom had a few good recipes for coating and frying the fish we caught. 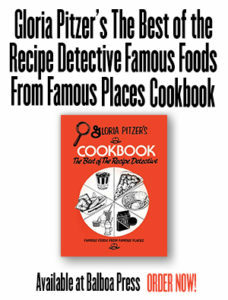 Below is Mom’s 1983 make-alike version of Long John Silver’s fish batter, as seen on page 111 in her last book, “Gloria Pitzer’s Cookbook – The Best of the Recipe Detective” [published by Balboa Press (January 2018, 1st Printing) – a re-write by me, Laura Emerich, of Mom’s famous, self-published book, “Gloria Pitzer’s Better Cookery Cookbook” (May 1983, 3rd Printing)], asking only for proper credit if you care to share it. 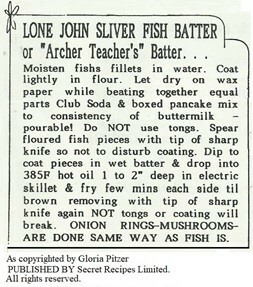 LONE JOHN SLIVER FISH BATTER – Similar in texture and flavoring to my “Archer Teacher Batter” but made a bit differently. You can pirate your way through a seaworthy voyage of vittles with this crispy fish coating! 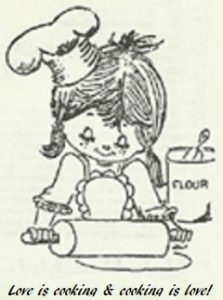 Combine flour, biscuit mix, season salt and sugar. Set aside. Beat egg and oil, adding to half of the club soda or beer. Stir in flour mixture, plus enough more club soda or beer to make it the consistency of buttermilk (as in my “Archer Teacher Batter” recipe.) Stir in lemon rind and onion salt. Tenderize fish fillets in buttermilk as directed in my Treacher recipe (see Index.) 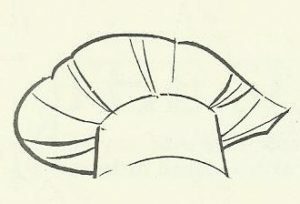 Drain fillets and dredge in plain flour. Allow them to dry a few minutes. Dip to coat in prepared batter and fry, a few pieces at a time, in 425°F oil/Crisco mix as directed in my Treacher recipe. When golden brown, remove and keep warm on a paper-lined cookie sheet in a 300°F oven until all pieces have been fried. 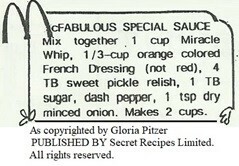 Serve with my Tartar Sauce (see Index.) 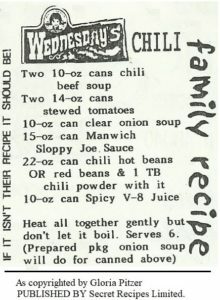 Serves 4 to 6 sensibly! 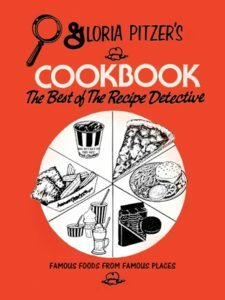 Note: Mom found in later years that the fish coating fried best in 385°F oil.